Working with PCL Construction is more than just a job for Bob Olbrich. He has dedicated his life to his work. On Sept. 7, the PCL staff and many of Bob’s coworkers and friends will pause to celebrate Bob’s remarkable 60-year anniversary with the company. Though employees with Bob’s work ethic can be difficult to find. Age is just a number to the soon-to-be 77-year-old. Despite having several years, if not more, on the majority of his coworkers, Bob shows no signs of slowing down. He still routinely logs a 12-hour work day, five days a week. His coworkers aren’t surprised to see him check in on weekends, either. It’s likely Bob inherited his father’s work ethic. As a prisoner of war from his days serving in the Germany army, Bob’s father was eventually sponsored by a farmer in the Yorkton area. Bob emigrated to Canada in 1950 and Regina became his first and only home in this country. He attended St. Joseph School before he began his carpentry work as a teenager. His father also was a carpenter. Bob began his career with PCL in 1958 when the company was known as Poole Construction. He was a second-year apprentice carpenter at the time. His memory is a little foggy, but Bob recalls his first projects with Poole working on the construction of Grant Road School or St. Mary’s church. Poole Construction/PCL has been the only company Bob has ever known. Bob’s career is one of two loves in his life. The other, his wife, passed away 20 years ago. They were together for 42 years and married for 37 years. In a way, his wife’s passing inspired him to continue with his craft. 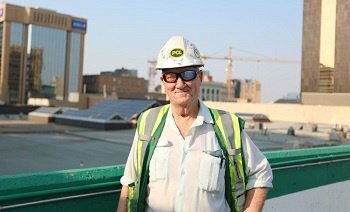 Sixty years on the job and Bob can drive around the city and marvel at some of the projects he has worked on. One of his prouder moments of his career was in 1981 when he was working in the SaskTel building adjacent to the Cornwall Centre, which was being built at the time. Bob’s primary duties were focused on the construction of the executive suites, where his woodworking skills shone. Oak and other heavy wood were mainly used on that site. Bob’s career took him out of the province as well. He was summoned to Ottawa for a few months to lend his knowledge and experience as a superintendent to assist in the construction of a highrise tower at the University of Ottawa. These days, Bob is busy with the deconstruction of the Sears store at the Cornwall Centre. As far as retirement goes, Bob said he’s not ready for that yet.